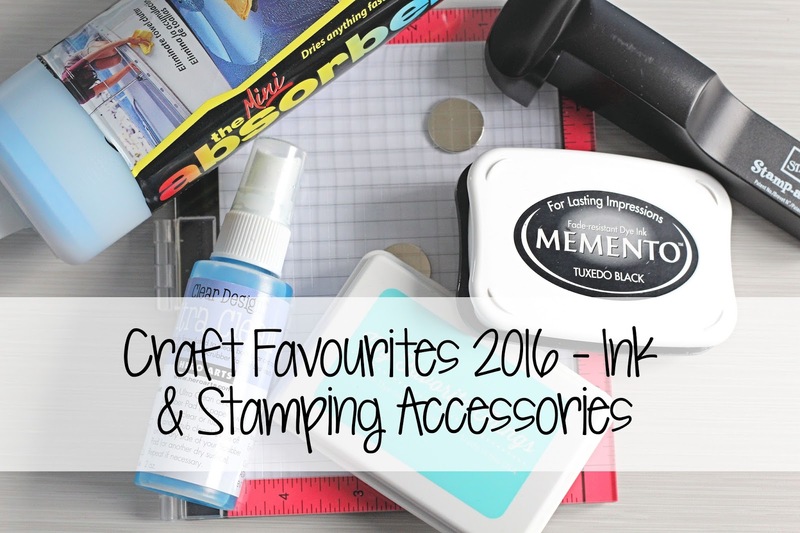 Hello there, today in my next instalment of my Craft Favourites of the year, I will be talking about my favourite ink pads and stamping accessories. This year, I decided to invest in a Mini MISTI and I have to say, I love it! I do have the regular size but found that I wasn't using it much. It was a bit of a gamble getting the mini too, in case I didn't use that one either, but actually I use it quite a lot. I still like acrylic blocks but I am finding that I use the MISTI quite a bit and I think it is a great investment. I am still using the same products to clean my stamps and most of the ink pads are the same too. The new ink pads that I came across this year were the dye ink pads from MFT. We got them over here in the UK and I have to say, they are great! Here are the links to what I have shared in the video. Please click on the picture or wording to be taken to where I purchased it. Affiliate links are used on some products. This means that if you make a purchase after clicking on my link, I receive a small commission with no extra cost to you. I truly appreciate your support when using these links. This is great Michelle!! I always wonder what everyone uses or can't be wothout! I would need to say I can't do without my stamp chamois from lawn fawn, it's so good it cleans your stamps of the ink with no fibres left behind! Hope you've had a lovely Christmas and Santa spoiled you rotten! Thanks for sharing your favorites. I love my Misti mini and original size; I like using both with layering stamps especially doing multiples of cards! I really like all your ink choices and the black ink that I use the most is Versafine Onyx Black. Thanks Michele. I am new to your blog and will go back and watch more of your videos-oh Boy!